The past two weeks back in Wonosari have been eventful—filled with adventure, teaching, frustration, laziness, coughing, naps, and homemade smoothies. My time in the classroom was met with mild success. I co-teach ten 80-minute, roughly 30-student classes each week. Six of them are tenth grade classes, and the other four are eleventh grade. My eleventh graders were taking a test the first week, so I only had the tenth grade students. I had them all make nametags so I can at least try to learn their names. I also had them all introduce themselves to me and bribed them with American permen (“candy” – chocolate and fruit flavored Tootsie Rolls that traveled spectacularly). Hopefully that’ll give a little encouragement and take away some of the fear of talking in front of/with me. Their English isn’t too great and only about 30-50% of the students will go to college. This plus the whopping 17 classes every student has to take (the normal smattering of history, math, science plus a handful of religion-based courses like Arabic because I’m at an Islamic school) adds up to very little motivation to learn English and very little time to practice it. Trying to find a way to actually make a difference in the classroom when I see the students once week (if I’m lucky) has been one of my greatest struggles. I haven’t been here too long yet, so I’m cutting myself some slack. But I am at a bit of a loss for how to approach the situation. By far one of my favorite moments was when I asked one guy what his favorite colors are. He responded with “black and yellow. You call me Wiz Khalifa.” I was impressed and am very tempted to oblige. This past week was my second week of classes, and it was rather short. We had off Wednesday and Thursday for the Muslim holiday Idul Adha (some celebrated it on the 23rd, some on the 24th), and then we had off Friday because the students were hearing some sort of presentation from local universities (???). This means I only met with two of my classes. One of them at least was an eleventh grade class, but I’ve still not met three entire classes (and I won’t this coming week because the students have midterm exams so no class). Lesson on the passive voice…. realized that I could barely tell which sentences were passive and which were not (mistake #3). In frantically trying to clarify the structure of passive voice, and ensure lots of learning was indeed happening, I spoke at a slightly-flustered-Bryan pace. My default speaking pace is sprinter-with-caffeine, so this was more like sprinter-with-caffeine-being-chased-by-cheetah (mistake #4). We ended with a game where I played music and they tossed around a blow-up globe and whoever had it when the music stopped had to go up to the board and change a sentence (no earthquakes, clouds, or tulips this time) from active to passive voice. This went over well, though I doubt the passive voice was learned by the students. My tenth grade class was a little better, but that’s not saying much. I made the mistake of thinking class was over twenty minutes earlier than it was and so our entire lesson plan was awkwardly short. We were talking about intentions (“What will you do for the Idul Adha holiday?”), which sounds easier enough. But there was a lot of floundering. I tailored the globe game for this class, so that was a positive. Shoutout to all the teachers I know for being awesome. I understand now. some food using all five fingers like a small, obedient arcade crane, and then bring your hand to your mouth and, using your pinky, ring, and middle fingers as a plate, push the food in with your thumb. Do not open your hand until you are positive all food has been shoveled in or you will end up with rice all of your face, your lap, the table, and your dining companions. I am not a Jedi yet, so it will take many more meals for me to figure this one out, but I’m on my way. me. Often, I will feel full and be unable to eat everything. My Ibu’s fave phrase has become “Finish it.” When she says this, her normally warm and affectionate voice takes on a steely tone and she becomes a mob boss who wants her lackey to off someone. This frightens me. The end result is that I immediately devour anything and everything in sight. This has led me to eating mysterious pieces of goat meat, at least three tons of rice, and chugging a coconut. A Muslim Festival of Sacrifice, Idul Adha is a holiday commemorating Abraham’s obedience and willingness to offer his son, Isaac, as a sacrifice at God’s command. Just before Abraham did so, God intervened and stopped Abraham, saying that was good enough proof of Abraham’s willingness to follow His word. God gave Abraham a ram to sacrifice in Isaac’s place, and all was good. Some of the neighbors gathered for Idul Adha. Immediately to their left, men are divvying up the animals. that the meat is halal [which is a similar concept to Judaism’s kosher mandate]), and there was very little blood on the ground when I got there. The butchering itself, too, was extremely fast and efficient. The men in the community worked together with amazing speed and dexterity to divvy up the meat and organs. All around was the buzz of life—families looking on, talking, celebrating. As odd as it may sound, the feel was similar to a lively yet reverent neighborhood barbecue in the United States (only instead of cooking burgers, they were making them). I was welcomed at the celebration with open arms. 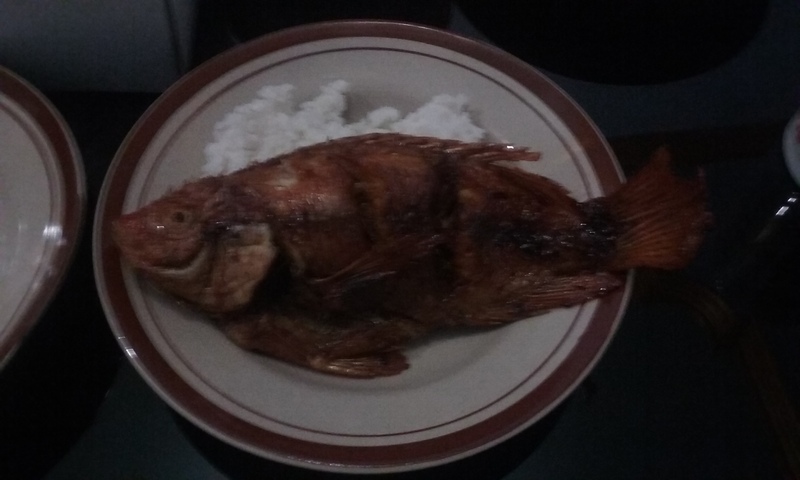 I realized later when a knock came and I received a bag of my own very fresh meat that I was welcomed to the community with open arms as well. Wonosari is known for its many (banyak) beaches (pantai), and after the Idul Adha ceremony, I was finally able to visit some of them! Bu Mul and myself piled into the car with her daughter, brother, sister-in-law, two of her nephews, and one of her nieces, and headed south to check out some beaches. (Note: I’d visited Bu’s village the day before and met her entire extended family and dozens of neighbors—it was exciting and I got to practice my Bahasa Indonesia and eat food, and it was also exhausting. Meeting people is hard enough when you both speak the same language). 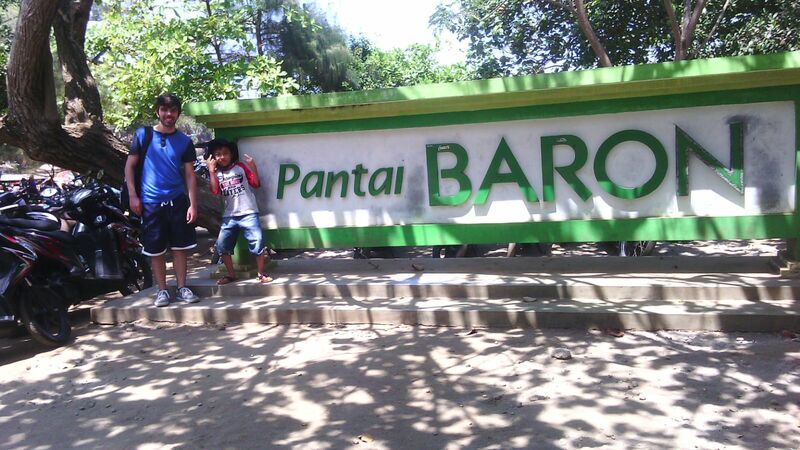 The first beach we went to was Pantai Baron, and it was covered in colorful wooden fishing boats and tourists. There was a tide pool area, so lots of people were hanging out in the shallow waters there. The water was warm and delightful and I wanted to go in, but no one else did so I thought better of it. I wore sneakers, which was foolish. Next we moved on to Pantai Kukup, which has a cliff-ish spot overlooking the water and some coral reef. There were people everywhere on the reef with plastic buckets and little fish nets scooping up the many little creatures that live in the reef. We ate a lunch of rice and goat and chicken and beef (and my first coconut! ), and then the younger group went down to try our luck on the reef. I was terrible, but it was a lot of fun. After that, we went to Pantai Sepanjang. 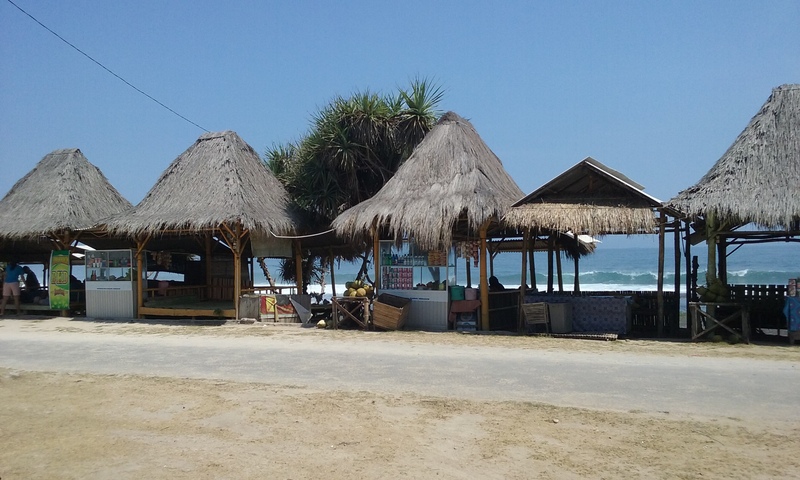 This beach looked the most “tropical,” with a line of little grass huts along the roads selling coconuts and food and hats and everything else. This one was really just a pit-stop so everyone else could pray, but it was pretty nonetheless. 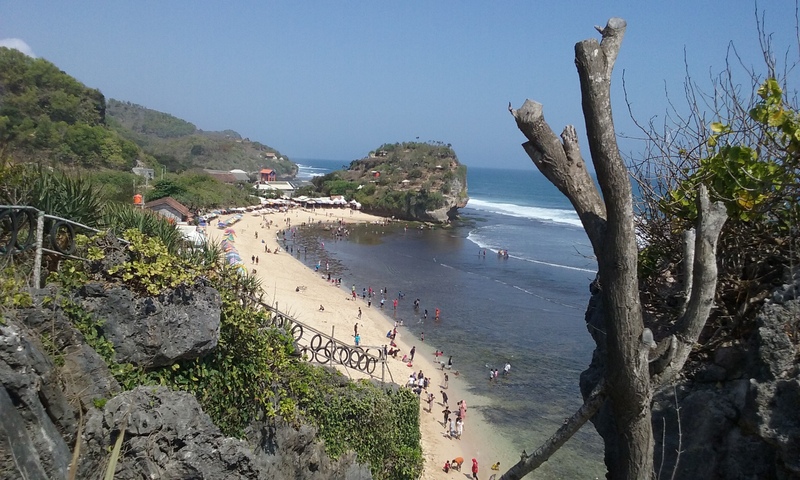 The final beach we went to was Pantain Indrayanti, which I’ve been told is the beach to go to. It was definitely the most crowded, and featured a little reef like Kukup. There was also a large rock you could climb, so a few of us went up and enjoyed the view. Again, I wanted to go in, but I didn’t have a change of clothes and only Bu Mul’s little nephew went, so I just relaxed a little on the beach. It’s odd seeing the beach culture here, which is very different from the Jersey Shore’s. We beach-hopped, and it seems like that’s what most people do—you don’t camp out all day lazing around at one beach. People here also don’t really swim the way we do in Jersey. Instead of going out to the deeper water with waves (and dangerous currents), they huge the shore and go under by just laying flat on the sand. No beach towels. No lifeguards that I saw. Very small beaches with large rocks/cliffs on the sides. Beach attire is also very different. Because Indonesia is predominantly Muslim, almost all of the women had jilbabs covering their heads and pretty much everyone, men and women, were fully clothed. No bathing suits (except mine), no skin showing (except the chests of a very small number of younger guys), jeans, sleeves, everything. It was strange to me, especially in such a hot place. Neat to see though! –Went to an Indonesian concert—Ebeit G. Ade who plays the acoustic guitar and sings great, melancholic songs. –Went to the immigration office in Jogja for the first of what I’m sure will be many, many painful times. It was awful and is one of the circles of hell and is worse than the DMV trust me and you don’t want to go there ever but they rejected me so I’ll be back real soon and I cannot wait. –Went to a tailor (penjahit, not to be confused with penjahat, which means “criminal”) and had my very own batik shirt made out of the school’s new Thursday uniform fabric. Some of the teachers became official civil servants and brought doughnuts for everyone! –Tried goat liver. And bladder. And just lots of goat in general. –Met a new frog friend who hangs out in a damp corner of my kitchen and, no matter how many times I move him (or her) outside, always finds her (or his) way back. Considering kissing it and see if royalty pops up in my kitchen (I do live in the Special District of Yogyakarta which is ruled by a Sultan, after all). –Began riding my bike a lot to explore the neighborhood and Wonosari, and just to get some exercise. I wasn’t a huge biker back home, but here it’s much more convenient and allows me to zoom past people with a smile and a selamat sore (good [late] afternoon). When I walk, I have trouble making it ten minutes without being stopped, and people often call out to me. It’s never in a mean or offensive way, but my otherness is very apparent and I haven’t gotten used to or comfortable with it just yet. 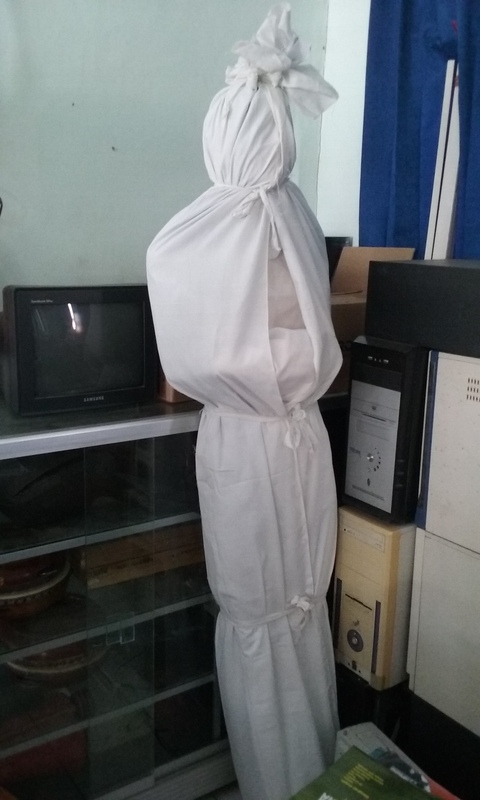 One of the things the students learn in school is how to prep a body to be buried. (1) Wait two hours to make sure it is indeed dead. (2) Wash the body. (3) Wrap the body in white cloth (regardless of status while alive, all Muslims are buried in a simple white cloth). (4) Pray. (5) Put the wrapped body into the ground. grant administrators in Indo, AMINEF, required all of the ETAs to get. I chose activities (dialogues and pronunciation work) that I felt hit at the areas I need the most work in (speaking in full sentences and not sounding like one of the goats that lives next door when I attempt Indonesian). My tutor, a Bahasa Arab teacher at school who’s about the same age as me, was very patient, took what the book gave and extended it to be more relevant, and used Google Translate with me like a champ (Google Translate is my life, my everything.). He also taught me the slang word jomblo, which is a term for an unmarried, single individual (male or female). We’re both v jomblo. –Struggled with electricity. For a four day stretch I couldn’t use the air conditioning, fridge, and lights at the same time or I’d trip the breaker. This was particularly frightening when it first happened because it was night and dark and the breaker is outside. Quickly overcame that fear and was glad I brought a flashlight. After many visits from various electricity professionals, we finally fixed the problem (still unsure what it was). I never realized how much the lone bedroom airconditioner meant to me. –Learned how to pay the water and electricity bills! –Went into Jogja with Bu Mul and three students to cheer the students on in an Indonesian constitution competition. –Learned how to take the bus to/from the big city! Met Ryan on the right and rode with him to the Bansari neighborhood mosque where I kicked around a soccer ball with the younger kids for a little. This cookie-dough-like substance is actually meat paste used for making bakso, spongy Indonesian meatballs. I have a lot of meat paste in my freezer. Some street art right around the corner from my home! Pantai Indrayanti deserted lifeguard stand? Visited one of the Ibu’s from school at home. Her son was loving the Tootsie Rolls I gave him. Dad would be proud. Pantai Kukup–gotta catch ’em all! Indonesian concert at the alun-alun (large greenspace) in Wonosari! The teacher’s room at school. Every teacher has a desk and because the teachers, not the students move, this is where everyone hangs out when they don’t have class. The WiFi is great. Can I go back and major in Oreology? Notice the boy in green practicing his ballet moves and the kid in the red in front of me. He insisted on continuously tickling me and then broke out into song, singing “Jingle bells, jingle bells, jingle all the way” over and over again. I was visibly shocked. Anyone want some kool pot ice cream? So sorry that it’s been forever since I’ve posted. I decided I wouldn’t blog while I was at orientation in Bandung (from August 30-September 13) because I figured not much would happen. I was a fool. I’m going to do a quick re-cap of my adventures in Bandung, and then I’ll start posting about Wonosari again! 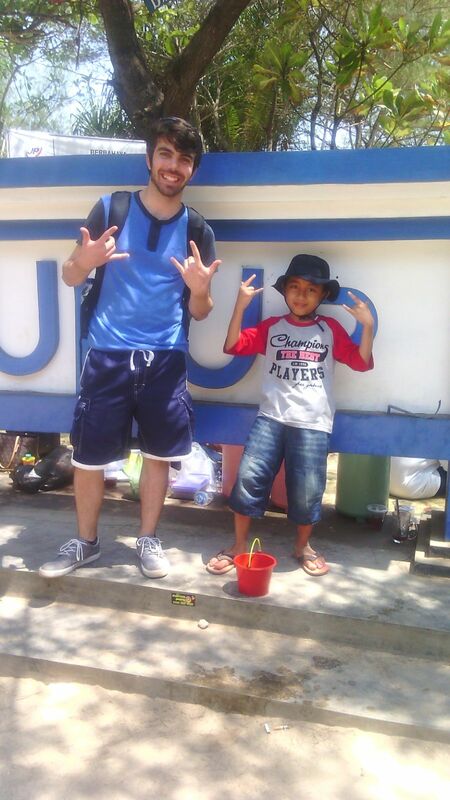 The first week in Wonosari was extremely difficult. I made a mountain of mistakes, waffled around a lot, tried not to drown my new lizard and ant friends in tears, and attempted to re-learn how to do basic life things. At the end of the week I was exhausted and knew I needed the time in Bandung—not just to begin getting an actual grip on Bahasa Indonesia and communicating, but also to mentally prepare myself for what my life will be for the next nine months. When I met the four other ETAs flying out of Jogja (shoutout to Julia, Kendra, Safiyah, and Savannah) I realized just how much I also needed interaction with others going through the same craziness as me. 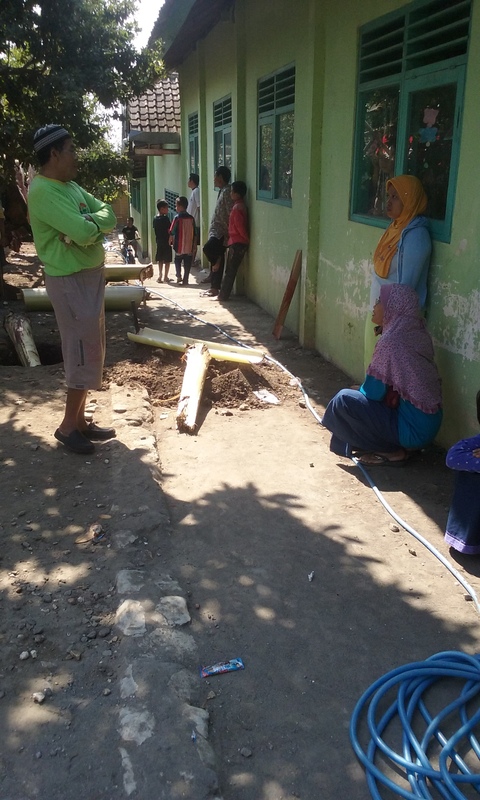 We talked the entire trip and it was an excellent lesson in the importance of not only connecting with my community in Wonosari, but also connecting with my fellow ETAs—I never knew what a luxury it was to communicate free and easily in English. Orientation took place in the lovely Hotel Sheraton in Bandung, and it was great. Enormous, warm shower; enormous, fluffy bed; Western food left and right (literally, they gave us snacks and coffee during every break and breakfast and lunch were sprawling buffets). I spent a good 85% of the time in that hotel eating. I needed to stock up on not-rice before being immersed in rice. Almost every day we had sessions from 8am-5:30pm and they ranged from Bahasa Indonesia class to teacher training to grant-specific and Indonesia-specific panels, presentations, discussions. Evenings we had to ourselves, and we often ventured out into Bandung to explore nightlife and such that many of us won’t have access to at our sites (I for example, ate Burger King one night because there are no Western restaurants in Wonosari and I figured I could get my fix of processed chicken for the year). Bahasa class with Wisma Bahasa was by far my favorite. When we first got to Bandung we took a placement test and based on our results we were sorted into one of four classes (Ravenclaw, Hufflepuff, etc.). Three of them were beginner classes (for everyone who failed miserably) and the last was a post-beginner class (for the small group of Bahasa masters among us). I couldn’t identify a ship or the verb “to cook” in Bahasa, and so I was put in one of the beginner classes. There were eight of us under the tutelage of the wonderful Ermita, and we had a great time (and learned lots!). Definition: Sunglasses (literally “glasses black”). Definition to me: Karate battle cry–KACAMATA HITAAAAAAAAAAAAAAM. Also. Best joke of the orientation? How do you give someone a black eye? –Playing futsol (essentially indoor soccer) against the hotel staff. Though exceptionally unathletic, I managed to both successfully goalie and score a goal. –Hiking around Tebing Keraton with a group of ETAs and Cynthia and Chris. Cynthia is part of the Uber start-up team in Bandung and Chris is her German/Indonesian boyfriend. Both are awesome and we had an awesome time hiking to the top of whatever it was we hiked. We saw Bandung in the early morning with mist over it, hiked through jungle/rainforest, were feet away from monkeys in the wild, walked through a creepy Dutch army cave left over from the days of colonization, and drank coffee at the most hipster coffee place I’ve ever been to. –Co-teaching a lesson in the same Bandung school with my actual co-teaching, Pak Rifa. We taught about describing people and we rocked it. Selfie at the hipster coffee house. Our new friends and awesome guides for the day, Cynthia and Chris, are on the right closest to me. Glamour shot of Camille at the Pascal Food Market. Our new friend Theo treated us all to Starbucks. Because why not sell steaming hot cups of sweet corn in an electronics store? From my Bandung Hike. Truffula trees? One of the many malls in Bandung, a group of us visited this one our first night in the city and were shown around by Bandung-ite Theo. Picture it: I woke up at 6am to do yoga with some of the other ETAs and stumbled upon the dregs of a wedding (?) party. Took me a while to realize this plastic bag was not trash, but a person. I think he was alive? The most hipster coffee house in the world. Lots and lots of batik fabric at Pasar Baru. Me eating (rice and duck) traditional Indo style with my hands for the first time! I was awful! Group shot from the Bandung hike! I stole this photo from someone else, but there we all are! From my Bandung Hike. Creepy Dutch army cave. No lights inside. Luckily we all brought kindling and flint. Welcome dance at the Hotel Sheraton when we arrived! The Sheraton’s pool area. My room was right off of it towards the upper right of the pic. From my Bandung Hike. Ramon and Shalina looking fab. A bunch of us played futsol (indoor soccer) against the hotel staff. This monkey is straight up eating corn on the cob. Nebraska should consider adding Pet Red to the Lil Red/Big Red family. It’s been awhile since I had time/WiFi to post, but I’m in the city Bandung for a two week orientation and I have the internet! 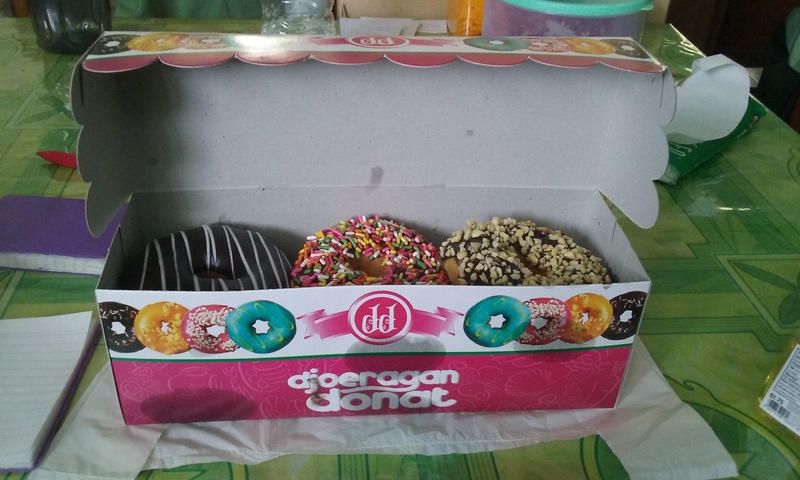 So here’s finally a post with some more about my first week in Wonosari. It, too, is also long and rambly. It, too, is also a far cry from Dickens or Marvel. For breakfast today I had a tiny banana and a Nutella+strawberry jam+tiny banana sandwich with some instant coffee I stole from the hotel in Jakarta. The coffee was pretty terrible, but the breakfast was great and did wonders for my mental health. Pak Rifa briefly explained how to walk to school yesterday. I decided I would try to do that instead of making him pick me up. I left 40 minutes to get to school even though it’s only about 10 minutes away because a sense of direction is not one of my gifts. Somehow, miraculously, I DIDN’T GET LOST! It’s all about the small victories. 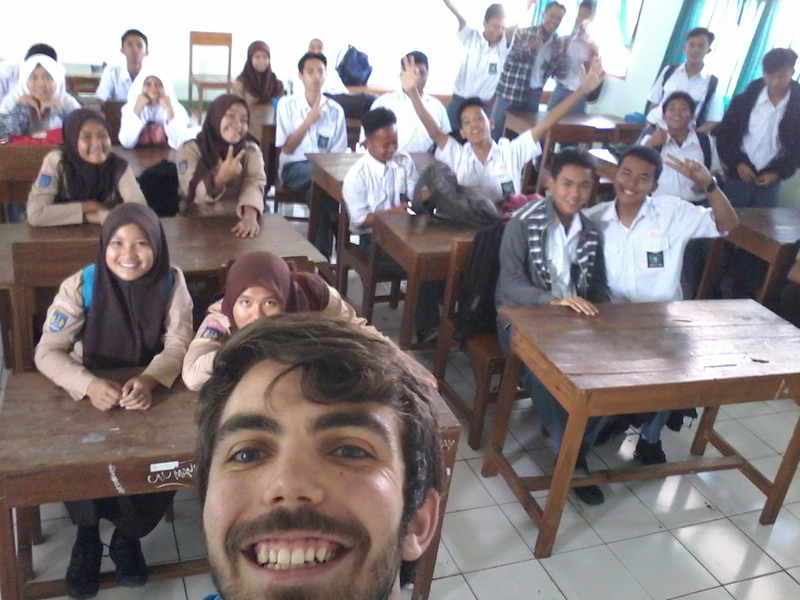 I also tried to speak a little Javanese, the local language spoken throughout Central Java, in each class. Although “Nami kulo Bryan” (my name is Bryan) wasn’t much, it made the kids laugh without fail. For lunch, Bu Mul took me to the former ETA at my site, Anna’s, favorite restaurant. We got lotek, which is sort of an Indonesian salad with vegetables and such, but way better. I also had dawet, which is a traditional drink that is excessively sweet and has gelatin-like chunks made from some type of leaf. Pak Rifa runs the English club, which meets every Wednesday (rabu). Today was their first session, and he asked each student to come up with a question to ask me and ideas for what they wanted to get out of the club. Questions included “How old are you,” “What do you think of MAN Wonosari?” and, my personal favorite, “Can you tell us the history of America?” It was difficult for me to think of a way to concisely and simply put our history, so I tried to explain that we were colonies of Great Britain like Indonesia was a colony of the Netherlands. We fought for independence and got it and then slowly started moving west. Among the things they want to learn are about America, how to speak English confidently, how to give speeches, about storytelling, how to sing English songs, and about theatre (I’d told them all I studied theatre). Hopefully I can deliver! Once I got back home, I introduced myself to my neighbors across the way and brought some Oleh-Oleh. I spoke as much Indonesian as I could and relied heavily on smiling. It was far from perfect, but not bad. 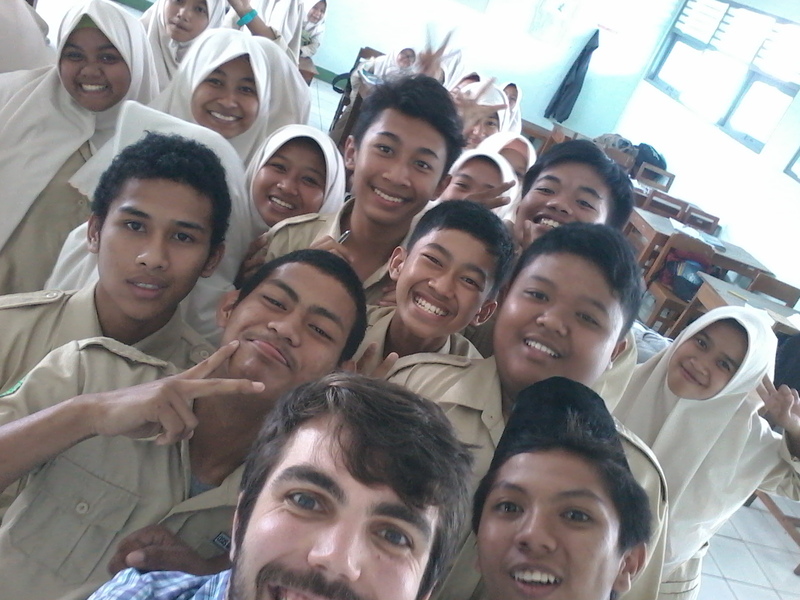 This morning I sat in on one of Bu Fitri’s 11th grade English classes. She’s my other co-teacher, and it was really great to observe and see what the students are learning (how to write invitations and letters), how they’re learning, and how they are with English. 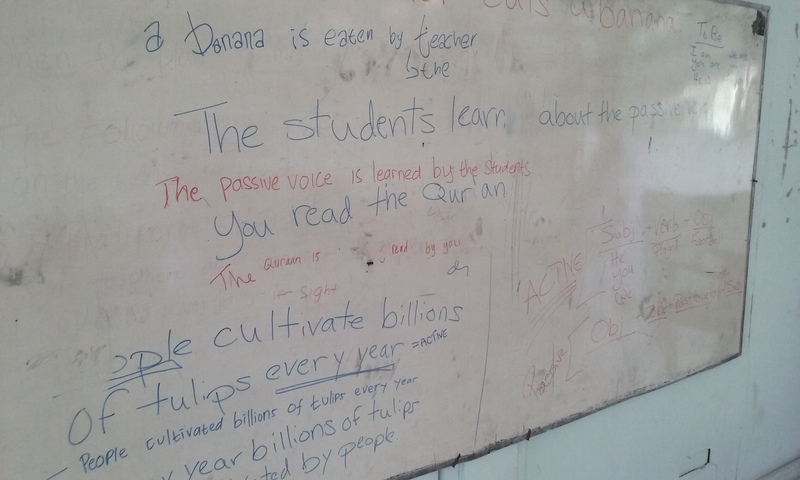 Later I sat in on one of Pak Rifa’s English classes, and that was great too. After school, Pak Rifa and I went to get food (I treated him this time!) so that I could practice ordering in a restaurant. I crashed and burned. Even though I pretty much understand all of the numbers, I can’t comprehend anything at normal speaking pace. I just panic, squinch up my face in a “confused-help-me” look and swivel to Pak Rifa to save me. Bu Mul was looking for me, so we took the food back to my home and ate there. Bu Mul had left a bowl of fruit for me (this is where the tiny breakfast bananas came from) when I first moved in and she brought it over to the table. Before she and Pak Rifa left, I asked for help with the fruit. I don’t recognize most of it and so have no idea how to eat it. They explained how to eat starfruit, and showed me how to eat salak or snake fruit (which is very aptly named because the skin literally looks like scales. It’s freaky actually, but tastes good). Bu Mul also showed me how to work the television in the house (!!!!). I don’t anticipate using it much, but it’s still good to know. Before they left, I noticed a big lizard (still small, but a fat small lizard) on my ceiling and a little baby lizard in front of it. I turned to Pak Rifa and said, “Look, a family!” The second the words came out of my mouth, the fat lizard pounced on the baby lizard, suffocated it, and swallowed it whole. After a moment of shock, Pak Rifa let out a laugh and said “Family.” Unsure whether Fat Liz(ard) was sending me a mafia-esque threat to behave or protecting me a la secret service. As I was saying, after Pak and Bu left, I decided to venture out and explore the neighborhood instead of hiding in my air conditioned bedroom. I was only about ten minutes into my walk when one of the people I said hi to invited me into his home for tea. They told us many many times at the Pre-Departure Orientation in D.C. that we should always say yes—that’s how you’ll really experience the culture. So I said yes. Complete stranger, but he seemed nice enough. We had hot (and sweet) tea and chatted. His name is Pak Doressaetyawan (maybe?) and he has an eleven-year-old son. He works at a bank in Jogja (which is about an hour/hour and a half away). My Indonesian and his English couldn’t get us too far past that, but it was nice. His wife brought out a plate of fried sweet potatoes snacks. They were delicious. Then he asked me to stay for dinner. Again, I thought, why not? So I did. We had nasi (rice), tahu (tofu), and some sort of soup with corn in it. I told him Nebraska, where I went to school, is famous for its corn. We exchanged phone numbers and he gave me the rest of the sweet potatoes to take home. I’ll have to stop back and thank him and his family for their kindness. I thought I’d just about escaped making any enormous cultural faux pas when WHAP. He asked for a picture with me and I said sure! His wife (in shorts and out of her jilbab [head covering]) took the picture. I asked her to join us and be in the picture and she, only slightly uncomfortably, insisted “No. Shame” and pointed at her head. I didn’t realize she couldn’t take a picture without her head covered. It’s slow going, but I’m learning Bahasa Indonesia and Indonesian culture sedikit demi sedikit (little by little, as one of the teachers at school told me). I went home after dinner and decided that, since it was almost 6 and dark out and I go to bed around 10 because exhaustion, that I’d shower and lounge around the house. After a semi-successful run-in with my shower I took out my computer, tried and failed to make the magic WiFi corner work, and decided just to write and hope I could get internet at school tomorrow. Now I want you all to think back to that line I asked you to remember. I was right there in my writing when I heard a vehicle pull up and my gate scrape open. By this point it was dark and 7:15 and I wasn’t expecting anyone and then someone called my name from outside and I felt like I was caught in my curlers and my bathrobe with my fuzzy slippers on (I was in basketball shorts, a tshirt, and my glasses, so pretty much the same). I was a bit unnerved, but happy to see Pak Pandu, another teacher at the school. About 20 students live at MAN Wonosari, and Pak Pandu is the teacher who lives with them and acts as dad and RA. Pak Rifa and Bu Mul both live far away, so Pak Rifa explained that Pak Pandu is the person I should call if I need anything or want to explore or eat or something. So happy, but surprised. He asked if I’d eaten and unsure how to respond I kind of mumble-slurred something unintelligible in English. He said he was going to take me out around Wonosari at night. So I hopped on his motorcycle and we drove around. The cool night air mixed with all of the banners and lights left from the Indonesian Independence Day celebration made for an exhilarating experience. We grabbed dinner (because now I’m eating ten meals a day like a hobbit), drove around some more, stopped at a really hoppin’ park with a sculpture of a broken plane that was actually just a mounted broken plane, and had some streetfood meatballs that were very spicy. I’d thus far been shielded from makanan pedas (spicy food) by Pak Rifa and Bu Mul on grounds that my stomach might rebel, but I dove in. It was good, but set fire to my tongue. Pak Pandu insisted on buying both the dinner and the snack saying, “Tonight is your night.” It made all of the stresses of the past few days melt away. I can do this! I have another friend! Hooray!